The President of Pakistan (Urdu : صدر مملکت پاکستان‎ — Ṣadr-e Mumlikat-e Pākistān, Urdu pronunciation: [ˌsəd̪ˈr-eː ˈmʊm.lɪˌkət̪-e pɑː.kɪs.t̪ɑːn]), is the head of state of the Islamic Republic of Pakistan and the civilian Commander-in-Chief of the Pakistan Armed Forces, per the Constitution of Pakistan. The office-holder represents the "unity of the Republic". 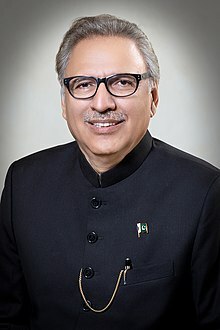 The current President of Pakistan is Arif Alvi. The Constitution of the Islamic Republic of Pakistan, also known as the 1973 Constitution is the supreme law of Pakistan. Drafted by the government of Zulfiqar Ali Bhutto, with additional assistance from the country's opposition parties, it was approved by the Parliament on 10 April and ratified on 14 August 1973. 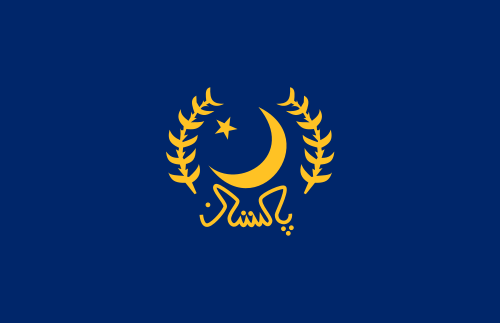 The Joint Chiefs of Staff Committee, is an administrative body of senior high-ranking uniformed military leaders of the unified Pakistan Armed Forces who advises the civilian Government of Pakistan, National Security Council, Defence Minister, President and Prime minister of Pakistan on important military and non-military strategic matters. It is defined by statute, and consists of a Chairman, the military chiefs from Army, Navy and the Air Force: all four-star officers appointed by the President, on the advice of the Prime minister. The chairman is selected based on seniority and merit from the Chiefs of service of the three branches of the Pakistan Armed and Defense Services. Each service chief, outside their Joint Chiefs of Staff obligations, performs their duty directly for the Ministry of Defence. The president is indirectly elected by the Parliament of Pakistan through the Electoral College for a five-year term. The Constitution requires the President to be a "Muslim of not less than forty five (45) years of age". The President resides in an estate in Islamabad known as Aiwan-e-Sadar (Presidential Palace). There have been a total of 13 Presidents. In the absence of the President, the Senate Chairman takes over as the Acting President until the President resumes office, or the election for the next President is held. The Parliament of Pakistan is the federal and supreme legislative body of Pakistan. It is a bicameral federal legislature that consists of the Senate as the upper house and the National Assembly, as the lower house. According to the constitution of Islamic Republic of Pakistan, the President of Pakistan is also a component of the Parliament. The National Assembly is elected for a five-year term on the basis of adult franchise and one-man one-vote. The tenure of a Member of the National Assembly is for the duration of the house, or sooner, in case the Member dies or resigns. The tenure of the National Assembly also comes to an end if dissolved on the advice of the Prime Minister or by the president in his discretion under the Constitution. The President of Pakistan is chosen by an electoral college, in Pakistan. According to Article 41(3) of the Constitution of Pakistan, this electoral college consists of the Senate, the National Assembly of Pakistan, and the Provincial Assemblies of the four provinces. Members of the National Assembly and Provincial Assemblies are directly elected by the people in competitive multi-party elections. Members of the Senate are indirectly elected by the provincial assemblies, for a term of five years. The Ceremonial guard of honour at the Aiwan-e-sadr. The Aiwan-e-Sadr or The Presidential Palace is the official residence and workplace of the President of Pakistan. The administrative head of Aiwan-e-Sadr is the Principal Secretary to the President of Pakistan. A presidential palace is the official residence of the president in some countries. However, some countries do not call the official residence of their head of state a palace or use the building only as a workplace separate from the president's actual home. Some presidential palaces were once the official residences to monarchs in former monarchies that were preserved during those states' transition into republics. The Cumhurbaşkanlığı Sarayı in the Turkey is the world's largest Presidential Palace, four times that of Versailles. Power politics is a theory in international relations, which contains the idea that distributions of power and interests, or changes to those distributions, are fundamental causes of war and of system stability. In politics, a figurehead is a person who de jure holds an important and often supremely powerful title or office, yet de facto exercises little to no actual power. This usually means that they are head of state, but not head of government. The metaphor derives from the carved figurehead at the prow of a sailing ship. The Chairman Joint Chiefs of Staff Committee (CJCSC) is, in principle, the highest-ranking and senior most military officer, typically at four-star rank, in the Pakistan Armed Forces who serves as a principal military adviser to the civilian government led by elected Prime minister of Pakistan and his/her National Security Council. The role of advisement is also extended to the elected members in the bicameral Parliament and the Ministry of Defence. The Chairman leads the meetings and coordinates the combined efforts of the Joint Chiefs of Staff Committee (JCSC), comprising the Chairman, the Chief of Army Staff and Chief of Air Staff and the Chief of Naval Staff, Commandant of Marines, DG Strategic Plans Division, and commanders of the service branches in the paramilitary command. The judiciary of Pakistan is a hierarchical system with two classes of courts: the superior judiciary and the subordinate judiciary. The superior judiciary is composed of the Supreme Court of Pakistan, the Federal Shariat Court and five High Courts, with the Supreme Court at the apex. There is a High Court for each of the four provinces as well as a High Court for the Islamabad Capital Territory. The Constitution of Pakistan entrusts the superior judiciary with the obligation to preserve, protect and defend the constitution. Neither the Supreme Court nor a High Court may exercise jurisdiction in relation to Tribal Areas, except otherwise provided for. The disputed regions of Azad Kashmir and Gilgit–Baltistan have separate court systems. There shall be a President of Pakistan who shall be the Head of State and shall represent the "unity of the Republic." And that I will not directly or indirectly communicate or reveal to any person any matter which shall be brought under my consideration or shall become known to me as President of Pakistan, except as may be required for the due discharge of my duties as President. May Allah Almighty help and guide me (A'meen). From 1947 until 1956, the Governor-General of Pakistan acted for the head of state: King George VI (until 1952) and Queen Elizabeth II (from 1952). With the promulgation of the first Constitution, Pakistan became an Islamic republic in 1956, and the Governor-General was replaced with the presidency. The incumbent Governor-General, Iskander Mirza, became Pakistan's first president. He reportedly suspended the first Constitution in 1958, and appointed Army Commander-in-Chief General Ayub Khan as the first chief martial law administrator. Khan subsequently dismissed Mirza in order to become the president. The second Constitution introduced by President Ayub Khan turned the country into a presidential republic without direct elections. Succumbing to internal and international pressure, however, Khan held a nationwide presidential election in 1965. Khan successfully campaigned against his opponent, Fatima Jinnah, for a second term, but some have alleged that elections were rigged in favour of Khan. Controversy regarding the U-2 incident (1960), privatization (1963), and war with India (1965), fueled a fierce left-wing opposition movement led by Zulfikar Ali Bhutto of the PPP and Bengali nationalist Sheikh Mujibur Rahman who, with the support of demonstrators, aimed to further weaken the presidency. Suffering from paralysis and declining health, Ayub Khan handed over the presidency to army chief General Yahya Khan, who imposed martial law and announced that nationwide elections would be held in 1970. Eventually, general elections were held in 1970 which saw the PPP gaining a majority of seats in West Pakistan (current day Pakistan) and the Awami League gaining a majority in East Pakistan (current day Bangladesh). After he was unable to reach a compromise between the PPP and the Awami League, President Yahya Khan invited Nurul Amin of the Pakistan Muslim League to become the Prime Minister, and also appointed him as the first Vice President. The growing instigated violence against Pakistanis in East Pakistan forced President Yahya Khan to use force in order to maintain order there, which further escalated Bengali resistance (1970). Preemptive strikes against India led to another war in 1971, which freed East Pakistan and created Bangladesh. Taking personal responsibility for the political isolation and devastation of Pakistan after the fall of East Pakistan, President Yahya Khan stepped down and ceded power to Zulfikar Ali Bhutto. President Bhutto created the current Constitution of Pakistan in 1973, transforming Pakistan into a parliamentary democracy, and reducing presidential powers to that of a ceremonial figurehead. The general elections held in 1977 resulted in an atmosphere of civil unrest instigated by the right-wing alliance, the Pakistan National Alliance. The events leading to it resulted in military intervention by chief of army staff General Zia-ul-Haq and Chairman Joint Chiefs Admiral Mohammad Shariff. Suspending the Constitution in 1977, General Zia-ul-Haq took over the presidency in 1978. Zia's presidency oversaw the modern growth of far-right ideas in the country. Succumbing to domestic pressure to restore the Constitution, President Zia-ul-Haq held a referendum (1984) and called for general elections in 1985. President Zia-ul-Haq appointed Mohammad Junejo as Prime Minister and assumed more powers through the constitutional amendment. After dismissing Prime Minister Junejo, President Zia-ul-Haq announced that new general elections would be held, but President Zia died in a place crash in 1988. The general elections held in 1988 witnessed the victory of PPP in 1988, and appointed Chairman Senate Ghulam Ishaq Khan to the presidency. Conflict between Prime Minister Benazir Bhutto and President Ghulam Ishaq Khan arose in two areas regarding the issues of appointments. President Ghulam Ishaq Khan repeatedly intervened in government matters and leveled charges against Prime Minister Benazir Bhutto; thus dismissing Prime Minister Benazir Bhutto in 1990. After holding general elections in 1990, Nawaz Sharif brought up an ideologically conservative government and President Ghulam Ishaq Khan unsuccessfully tried to dismiss Sharif. After a successful intervention by Supreme Court and Chairman Joint Chiefs General Shamim Allam, President Ghulam Ishaq Khan and Prime Minister Nawaz Sharif tendered resignations in 1993. After the presidential election held in 2008, Asif Ali Zardari lobbied for constitutional amendment to restore the Constitution as it was in 1973. In 2010, the Parliament unanimously and with a large majority, passed the eighteenth amendment of the constitution. It revoked the presidential powers and changed Pakistan from a semi-presidential system of government to a parliamentary republic, with great hopes of governmental stability in the future. The Eighth Amendment to the Constitution of Pakistan allowed the President to unilaterally dissolve the National Assembly and elected governments. The Majlis-e-Shoora amended the Constitution of Pakistan in 1985 and the law stayed on the books until its repeal in 1997. Javed Hashmi (pronounced [dʒæˈʋed̪hæ'ʃmɨ] );, is a Pakistani politician, political realist, and a senior conservative thinker on the platform of Pakistan Muslim League (N). The Thirteenth Amendment to the Constitution of Pakistan was a short-time amendment to the Constitution of Pakistan, adopted by the elected Parliament of Pakistan in 1997 by the government of people elected Prime Minister Nawaz Sharif. It stripped the President of Pakistan of his reserve power to dissolve the National Assembly, and thereby triggering new elections and dismissing the Prime Minister. The Constitutional Amendment was supported by both the government and the opposition, and was thus passed unanimously. With the enforcing of this amendment, Pakistan's system of government was shifted from Semi-presidential system to Parliamentary democratic republic system. The National Security Council is a federal institutional and consultative body chaired by the Prime Minister of Pakistan as its chairman. The NSC is a principal forum that is mandated for considering national security and foreign policy matters with the senior national security advisers and Cabinet ministers. The idea and inception of National Security Council was first conceived in 1969 under the President Yahya Khan, its functions were to advise and assist the president and prime minister on national security and foreign policies, since then, however, this idea of this institution remains highly debatable and controversial in Pakistan's political science circles who argues that the NSC provides legal cover for expanding the role and influence of the military science circles in nation's public and political science affairs to subdue the popular democratic transitional process in the country. Habib Jalib was a Pakistani revolutionary poet, left-wing activist and politician who opposed martial law, authoritarianism and state oppression. Pakistani poet Faiz Ahmed Faiz paid tributes to him by saying that he was truly the poet of the masses. The Second Amendment to the Constitution of Pakistan became a part of the Constitution of Pakistan on September 7, 1974 under the Government of Prime Minister Zulfiqar Ali Bhutto. It declared that Ahmadis were not Muslims. The Third Amendment to the Constitution of Pakistan is an amendment to the Constitution of Pakistan went effective on 18 February 1975, under the Government of elected Prime minister Zulfikar Ali Bhutto an amendment to the 1973 Constitution of Pakistan The amendment extend the period of preventive detention, of those who are accused of committing serious cases of treason and espionage against the state of Pakistan, are also under trial by the government of Pakistan. The III Amendment protect against the abuse of government authority in legal procedure, and extended the investigation period from one month to three month. The Fifth Amendment to the Constitution of Pakistan was adopted in September 5 of 1976, by the elected Parliament of Pakistan under the democratic government of Zulfikar Ali Bhutto. The V Amendment widen the scope of restriction on the Pakistan High Courts to strip powers of the High Courts to enforce the grants of natural fundamental rights explained in Chapter I, Part II of the Constitution. This amendment also imposed the import and sales tax on the consumer product. V Amendment also restricted the eligibility of the Governor or the Chief minister of those who are not from the provinces in which they have fought the elections for the respected offices. V Amendment also set the maximum age of the Chief Justice as well as the term of serving the respected office. The Seventh Amendment to the Constitution of Pakistan was adopted by the elected Parliament of Pakistan on 16 May 1977, a month before the ending of ending of the democratic government of Prime minister Zulfikar Bhutto. The VII Amendment was also the last of seven amendments that were adopted the elected Parliament and enforced by the Government of Prime minister Zulfikar Ali Bhutto. The VII Amendment orders and enables the people elected Prime Minister to obtain a Vote of confidence by the people elected members of Parliament. The VII Amendment also constitutionally orders the people elected President to hold a national referendum for the approval of Prime minister if he or she fails to secure the vote of confidence of the members of Parliament. 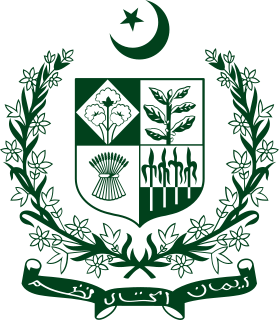 The Eighteenth Amendment of the Constitution of Pakistan was passed by the National Assembly of Pakistan on April 8, 2010, removing the power of the President of Pakistan to dissolve the Parliament unilaterally, turning Pakistan from a semi-presidential to a parliamentary republic, and renaming North-West Frontier Province to Khyber Pakhtunkhwa. The package was intended to counter the sweeping powers amassed by the Presidency under former Presidents General Pervez Musharraf and General Muhammad Zia-ul-Haq and to ease political instability in Pakistan. The bill reversed many infringements on the Constitution of Pakistan over several decades by its military rulers. The amendment bill was passed by the Senate of Pakistan on April 15, 2010 and it became an act of parliament when President Asif Ali Zardari put his signature on the bill on April 19, 2010. It was the first time in Pakistan's history that a president relinquished a significant part of his powers willingly and transferred them to parliament and the office of the prime minister. The Ninth Amendment to the Constitution of Pakistan would have imposed sharia law as the supreme law of the land by amending Article 2, 203B and 203D of the Constitution of Pakistan. The Tenth Amendment to the Constitution of Pakistan was enacted on March 29, 1987. It amended the article 54 and 61 of the Constitution by changing the duration of interval period between sessions of the National Assembly & Senate from 160 days to 130 days. The Eleventh Amendment Bill to the Constitution of Pakistan was presented in the Senate on 31 August 1989. It was moved by Senators Mr. Muhammad Ali Khan, Dr. Noor Jehan Panezai and Syed Faseih Iqbal. The Amendment sought to restore the seats for Women in National Assembly to 20. The bill was later withdrawn after the Government gave assurance that they intend to introduce the same bill themselves soon. The Twentieth Amendment Bill to the Constitution of Pakistan was passed by the National Assembly of Pakistan on February 14, 2012. It was then moved to upper house, Senate where it was passed on February 20, 2012 and signed by the President on February 28, 2012. The Sixteenth Amendment to the Constitution of Pakistan was passed by the National Assembly on July 27, 1999, by the Senate on June 3, 1999 and promulgated on 5 August 1999. The Fifteenth Amendment bill to the Constitution of Pakistan was Passed by National Assembly of Pakistan on 28 August 1998. It was then moved to the Senate where it was never passed. Shilokh Mission Hospital is the oldest hospital of the city Jalalpur Jattan founded by Dr Taylor in 1900s in British India. It was the first hospital of the region, which started in a tent and gradually transformed into a well known hospital. ↑ Article 243(3) Archived 2015-03-21 at the Wayback Machine in Chapter 2: The Armed Forces. Part XII: Miscellaneous in the Constitution of Pakistan. 1 2 Article 41(1) Archived 2016-02-04 at the Wayback Machine in Chapter 1: The President, Part III: The Federation of Pakistan in the Constitution of Pakistan. ↑ Article 46 Archived 2016-02-04 at the Wayback Machine in Chapter 1: The President, Part III: The Federation of Pakistan in the Constitution of Pakistan. ↑ Article 243(2) Archived 2015-03-21 at the Wayback Machine in Chapter 2: The Armed Forces. Part XII: Miscellaneous in the Constitution of Pakistan. ↑ Article 43(1)–43(2) Archived 2016-02-04 at the Wayback Machine in Chapter 1: The President, Part III: The Federation of Pakistan in the Constitution of Pakistan. ↑ Article 50 Archived 2016-02-04 at the Wayback Machine in Chapter 2:The Parliament of Part III: The Federation of Pakistan in the Constitution of Pakistan. ↑ Article 46 Archived 2016-02-04 at the Wayback Machine in Chapter 2:The Parliament of Part III: The Federation of Pakistan in the Constitution of Pakistan. ↑ Article 54 Archived 2016-02-04 at the Wayback Machine in Chapter 2:The Parliament of Part III: The Federation of Pakistan in the Constitution of Pakistan. ↑ Article 56 Archived 2016-02-04 at the Wayback Machine in Chapter 2:The Parliament of Part III: The Federation of Pakistan in the Constitution of Pakistan. ↑ Article 243(3) in Chapter 2: The Armed Forces. Part XII: Miscellaneous in the Constitution of Pakistan. ↑ Article 175A(3) Archived 2014-07-04 at the Wayback Machine in Chapter 2:The Parliament of Part III: The Federation of Pakistan in the Constitution of Pakistan. ↑ Article 45 Archived 2016-02-04 at the Wayback Machine in Chapter 2:The Parliament of Part III: The Federation of Pakistan in the Constitution of Pakistan. ↑ Article 248(1) Archived 2014-06-03 at Archive.today in Chapter 4:General of Part XII: Miscellaneous in the Constitution of Pakistan. ↑ Govt. of Pakistan (3 March 2010). "The National Command Authority Act, 2010" (PDF). Islamabad: National Assembly press. National Assembly press. Archived (PDF) from the original on 5 March 2016. Retrieved 6 May 2015. ↑ See: The XVIII Amendment to the Constitution of Pakistan. 1 2 3 4 Article 41(2) Archived 2016-02-04 at the Wayback Machine in Chapter 1: The President, Part III: The Federation of Pakistan in the Constitution of Pakistan. ↑ Crilly, Rob (10 May 2013). "Pakistan election guide: How does it work?". Telegraph, Pakistan Bureau. Telegraph. Archived from the original on 14 February 2016. Retrieved 18 May 2015. ↑ Article 41(3) Archived 2016-02-04 at the Wayback Machine in Chapter 1: The President in Part III: The Federation of Pakistan in the Constitution of Pakistan. 1 2 3 4 5 6 APP, Associate Press of Pakistan (25 July 2013). "706 Electoral College members to elect 12th President of Pakistan". News International, 2013. News International. Archived from the original on 2 August 2013. Retrieved 18 May 2015. ↑ Article 44(1)-(2) Archived 2016-02-04 at the Wayback Machine in Chapter 1: The President in Part III: The Federation of Pakistan in the Constitution of Pakistan. ↑ Article 44(2) Archived 2016-02-04 at the Wayback Machine in Chapter 1: The President in Part III: The Federation of Pakistan in the Constitution of Pakistan. ↑ Article 49(1)-(2) Archived 2016-02-04 at the Wayback Machine in Chapter 1: The President, Part III: The Federation of Pakistan in the Constitution of Pakistan. ↑ Article 49(1) Archived 2016-02-04 at the Wayback Machine in Chapter 1: The President, Part III: The Federation of Pakistan in the Constitution of Pakistan. ↑ Article 47(1)-(2) Archived 2016-02-04 at the Wayback Machine in Chapter 1: The President, Part III: The Federation of Pakistan in the Constitution of Pakistan. 1 2 Article 47(3) Archived 2016-02-04 at the Wayback Machine in Chapter 1: The President, Part III: The Federation of Pakistan in the Constitution of Pakistan. ↑ Article 47(5) Archived 2016-02-04 at the Wayback Machine in Chapter 1: The President, Part III: The Federation of Pakistan in the Constitution of Pakistan. ↑ Article 47(6) Archived 2016-02-04 at the Wayback Machine in Chapter 1: The President, Part III: The Federation of Pakistan in the Constitution of Pakistan. ↑ Article 47(6) Archived 2016-02-04 at the Wayback Machine in Chapter 1: The President of Part III: The Federation of Pakistan in the Constitution of Pakistan. ↑ Article 47(7) Archived 2016-02-04 at the Wayback Machine in Chapter 1: The President, Part III: The Federation of Pakistan in the Constitution of Pakistan. ↑ Article 47(8) Archived 2016-02-04 at the Wayback Machine in Chapter 1: The President, Part III: The Federation of Pakistan in the Constitution of Pakistan. 1 2 3 4 5 6 7 8 9 10 11 12 13 Web Edition (30 July 2013). "Mamnoon Hussain elected 12th President of Pakistan". News International, president. News International, president. Retrieved 18 May 2015. ↑ Waldman, Amy (January 2, 2004). "Pakistan Gives Musharraf Confidence Vote as President". New York Times. Archived from the original on May 15, 2013. ↑ timesofindia.indiatimes.com "Pakistan presidential poll on September 6." Times of India. 22 August 2008. ↑ radionetherlands.nl Pakistan to choose president on 6 September. Archived 2008-09-24 at the Wayback Machine Radio Netherlands. ↑ "Pakistan's presidential poll today, Zardari front runner." Archived 2009-01-03 at the Wayback Machine Times of India. ↑ afp.google.com "Bhutto's widower set to become Pakistan president." Archived 2008-09-09 at the Wayback Machine AFP 2008. Accessed 8 January 2014. ↑ nytimes.com "Zardari is elected Pakistan's president." Archived 2016-07-22 at the Wayback Machine New York Times 7 September 2008.